NASHVILLE, Tenn. -- Mike Vrabel was a proud coach in an emotional Titans locker room on Sunday. His team had just beaten the Texans 20-17, on a day when the Titans played with their back-up quarterback, and with reserve tackles. 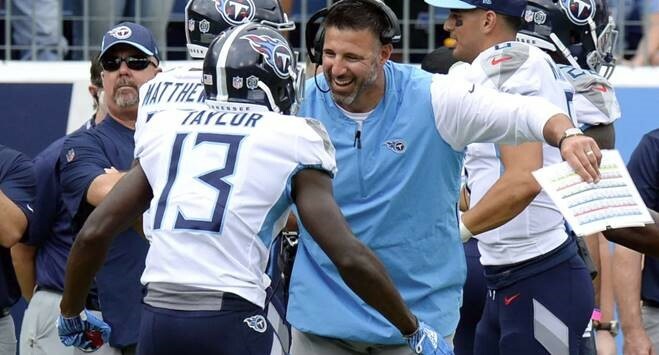 The Titans were also missing one of their key pieces in tight end Delanie Walker, but heading into the game Vrabel refused to take the woe-is-me approach. So after Vrabel talked to the team on Sunday at Nissan Stadium, Titans center Ben Jones thought he should be rewarded with a game ball after his first win. He stepped in and made sure he got one. Vrabel was happy to get the keepsake, even if he didn’t say it. Blaine Gabbert started at quarterback in place of Marcus Mariota. Tyler Marz and Kevin Pamphile started at the tackle position, and the team began life on the football field without Walker. The Titans showed some imagination on offense, using the Wildcat. Vrabel went for it on 4th down in their own territory, and got it. The team executed a perfect fake punt that went for a touchdown. Vrabel deflected questions about his first win after the game. He talked about his respect for Texans coach Bill O’Brien, his former boss. And he talked about how tough it is to win in the NFL. And he was quick to remind another big game is coming up in seven days against the Jaguars. “It wasn’t about me, and it shouldn’t be, and it won’t be,’” Vrabel said. “It should be about the players and the coaches who got them ready.